Glen Self, the family patriarch, always had a knack for fixing cars, and he found an interest in drag racing as well as unusual engines long ago. Never one to favor the favorites, Self made his name by running fast six-cylinder-powered race cars. In 1969, Glen drove his in-line Chevy six-cylinder-powered 67′ Camaro to the U.S. Nationals winner’s circle in the Street Eliminator category. Glen ran the camaro from 67′ to 1980. All through the 70′s he raced it three nights a week and that car may have won more races than anything out there at the time. Then, in 1985, Glen became the Fall Nationals Competition Eliminator champion, driving a Willie Rells-built ’85 Camaro, powered by a Buick V-6. The success continued with a Modified eliminator victory at the IHRA Bayou Nationals in Eunice, Louisiana. Glen just missed at Indy that year, scoring a runner-up finish to Buddy Ingersoll’s Turbo Buick V-6. At the time, Self was also contributing data and expertise to the Buick R&D program. Kevin Self has continued his fathers impressive legacy, both on the mechanical side of things, as well as driving the family’s F/Econo Altered. Kevin noted, “When I was 13 years old, my dad bought me a flow bench for my birthday. I’m 48 years old now, so that’s how much time I’ve spent doing what we do here at Self Racing.” . Self Racing holds U.S. Patent number 5,581,055 for the Self Air Tool Muffler, specially designed to reduce the constant noise generated by several types of air-operated hand tools. We’d have to guess many long hours spent hand-porting cylinder heads helped launch that product. 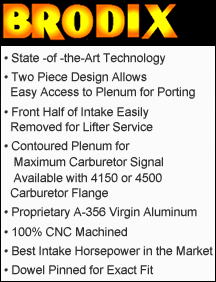 Self Racing also spearheaded another patented item called the Port Intruder, marketed by Brodix. It’s specially designed to alleviate problems when cylinder heads are “ported to the max.” When trying to extract the maximum flow characteristics from today’s cylinder heads by aggressive porting, cracking can occur in some areas of the intake port and the cylinder head deck. The Port Intruder Kit not only helps prevent cracks from occurring, but also allows the active intake port walls to be moved, achieving an improved flow by moving the head bolt out of the way. Self also holds a patent on it SE 100 intake manifold, which is manufactured by Brodix. Its unique design divides into two sections, allowing easy access for porting, as well as accessibility to the lifter valley on the block.